Cyclosporin H is a potent and selective formyl peptide receptor antagonist. 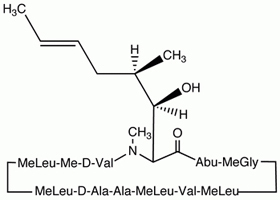 Comparison with N-t-butoxycarbonyl-L-phenylalanyl-L-leucyl- L-phenylalanyl-L-leucyl-L-phenylalanine and cyclosporins A, B, C, D, and E.
The cyclic undecapeptide, cyclosporin (Cs) H, is a potent inhibitor of FMLP-induced superoxide anion (O2-) formation in human neutrophils. We studied the effects of CsH in comparison with those of N-t- butoxycarbonyl-L-phenylalanyl-L-leucyl-L-phenylalanyl-L-leucyl-L- phenylalanine (BocPLPLP), a well known formyl peptide receptor antagonist, and of other Cs on activation of N6,2'-O-dibutyryl adenosine 3:5'-monophosphate-differentiated HL-60 cells and human erythroleukemia cells (HEL cells). CsH inhibited FMLP binding in HL-60 membranes with a Ki (inhibition constant) of 0.10 microM. CsH inhibited activation by FMLP of high affinity GTPase (the enzymatic activity of alpha-subunits of heterotrimeric regulatory guanine nucleotide-binding proteins) in HL-60 membranes with a Ki of 0.79 microM. CsH inhibited the stimulatory effects of FMLP on cytosolic Ca2+ concentration ([Ca2+]i), O2- formation, and beta-glucuronidase release with Ki values of 0.08, 0.24, and 0.45 microM, respectively. BocPLPLP was 14-fold less potent than CsH in inhibiting FMLP binding and 4- to 6-fold less potent than CsH in inhibiting FMLP-induced GTP hydrolysis, rises in [Ca2+]i, O2- formation, and beta-glucuronidase release. CsA reduced FMLP-induced O2- formation by 20%, but CsB, CsC, CsD, and CsE did not. CsA, CsB, CsC, CsD, and CsE did not affect FMLP-induced rises in [Ca2+]i. BocPLPLP inhibited leukotriene B4-induced rises in [Ca2+]i with a Ki of 0.33 microM, whereas CsH showed no inhibitory effect. CsH and BocPLPLP did not inhibit the rises in [Ca2+]i induced by several other stimuli in HL-60 cells and HEL cells. Our results show that 1) CsH is a more potent formyl peptide receptor antagonist than BocPLPLP; 2) unlike BocPLPLP, CsH is selective; and 3) N-methyl-D-valine which is present at position 11 of the amino acid sequence of CsH but not of other Cs is crucial for FMLP antagonism.